Summer squash (Cucurbita pepo) grows on non-vining bushes. Many varieties have different fruit shapes and colors. The three main types include the yellow straight neck or crooked neck; the white, saucer shaped, scallop, or patty pan; and the oblong, green, grey, or gold zucchini. Soil containing plenty of well-rotted compost or manure is ideal, although good crops may be grown in average soils that have been fertilized adequately. For extra early fruit, plant seeds in peat pots in greenhouses or hotbeds and transplant about three weeks later after danger of frost is past. Older plants that have hardened off and stopped growth will not transplant well and should be discarded. Squashes are warm season plants and do not do well until soil and air temperatures are above 60°F. Seed or transplants can be planted through black plastic. Cover seed with an inch of soil. Under good growing conditions, fruits are ready for first harvest 50 to 65 days after seeds are planted. 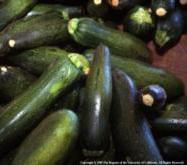 Zucchini types should be harvested when immature, about 6 to 8 inches long and 1-1/2 to 2 inches in diameter; patty-pan types, when 3 to 4 inches in diameter; yellow crookneck, when 4 to 7 inches long. If the squash rind is too hard to be marked by a thumbnail, it is too old. Remove old fruit to allow new fruit to develop. Check plants daily once they begin to bear. Squash, melons, and cucumbers belong to the same family, often called “cucurbits," and have a flowering habit that is unique among the vegetable crops. They bear two kinds of flowers, male and female, both on the same plant. In order for fruit set to occur, pollen from the male flower must be transferred to the female flower. The pollen is sticky; therefore, wind-blown pollination does not occur. Honeybees are the principal means by which pollen is transferred from the male to the female flower. The female flower in cucurbits can be recognized easily by the presence of a miniature fruit (ovary) at the base of the flower. Female squash flowers are much larger than the female flowers on melon and cucumber plants. The male squash flower can be identified by its long, slender stem. The female squash flower is borne on a very short stem. Gardeners often become concerned when many flowers appear early, but fruits fail to set. The reason for this is that all of the early flowers are males. Female flowers develop somewhat later and can be identified by the miniature fruit at the flower base. In hybrid varieties of summer squash, however, the first flowers to appear are usually females, and these will fail to develop unless there are male squash flowers - and bees - in the nearby area. 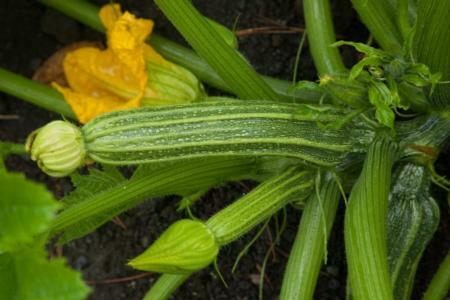 A common misconception is that squash, melons, and cucumbers will cross-pollinate. This is not true; the female flowers of each can be fertilized only by pollen from that same species. Varieties within each species, however, will cross-pollinate. Thus, zucchini squash will cross with crookneck or acorn squash, and similarly among varieties of cucumber, and among varieties of muskmelon. When more than one variety of a particular cucurbit is grown in the garden, they will readily cross, and seed saved from these plants will produce fruit which will be different from either of the parents. Original document by Hunter Johnson, Jr. retired, UCCE Vegetable Specialist, Riverside Campus.